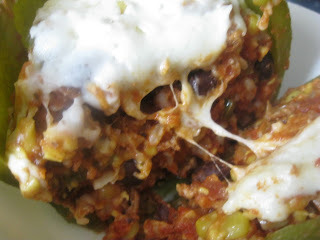 Making a freezer meal for your crock pot of stuffed peppers is a great way to use some of your garden's bounty! Cook and crumble ground meat. Set aside. 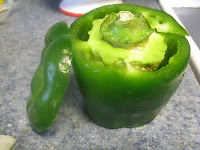 Make sure all green peppers can sit upright, if not cut bottoms even so they sit flat. 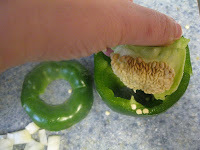 cut the tops off the pepper. Set the empty pepper shell aside. Repeat process with remaining peppers. Dice the pepper tops you trimmed off and set aside. 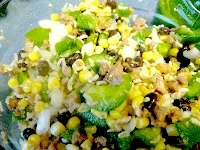 In large mixing bowl, combine meat, rice, beans, corn, onion, sauce, and cheese. 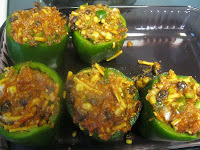 Stuff green pepper shells and set in side a baking pan. Flash freeze individual peppers by placing stuffed peppers on a baking sheet in the freezer for 1 hour till individually frozen. Then store peppers in a ziplock storage bag in the freezer. To Bake: CROCK POT: Thaw in the fridge overnight. Follow crock pot directions above. 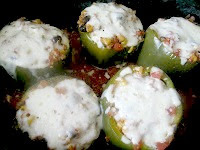 OVEN BAKE: Pull peppers out of freezer in the morning, and thaw in the fridge during the day. Follow the baking directions above to bake in oven. Nestle as many peppers as will fit in your crock pot into bottom of pot. Pour in 1 cup spaghetti sauce into bottom of pot around the peppers. Cook on low 6-8 hours or high 3-4 hours. Optional: top with more shredded cheese during the last 10 minutes of cooking remove lid from crock pot to melt cheese. surround peppers in a baking dish with about 1 cup of spaghetti sauce. Bake in 350 degree oven for one hour till peppers are tender.